I grew up in Coppell, Texas, where my family attended St. Ann Catholic Church. After graduating from Coppell High School in 2004, I attended the Franciscan University of Steubenville, Ohio and entered the Pre-Theologate Program. 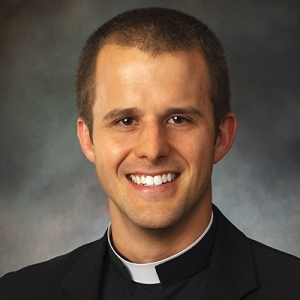 After graduating from Franciscan University in August of 2007 with a Bachelor of Arts in Philosophy, I entered St. Mary’s Seminary in Houston, Texas as a seminarian for the Diocese of Dallas. I graduated in 2012 from St. Mary’s Seminary and the University of St. Thomas in Houston with the degrees of Master of Divinity and Baccalaureate in Sacred Theology. I was ordained to the priesthood on June 2, 2012. I spent my first three years as a priest serving as a parochial vicar of St. Francis of Assisi Catholic Church in Frisco, Texas. In July of 2015, I was assigned as a parochial vicar to Mary Immaculate Catholic Church in Farmers Branch. Then in June of 2016 I was reassigned to Holy Trinity Seminary to serve on the formation faculty. In addition to serving as a formation advisor at Holy trinity Seminary, I am also the Director of Seminarians for the Diocese of Dallas. Walking with these men and helping them discern God’s will for their lives has been a source of great joy and blessing for me.